Reviews, previews, and views on the sci fi jungle, fantasy, urban fantasy, with a dash of science thrown in. Featuring information about books, movies, games, and tv with a science fiction theme. 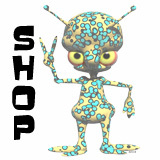 The store features illustrated, pen and ink as well as computer generated graphic design with various themes ranging from cute space aliens to futuristic urban scifi art. The hubster andI have been married 16 years. I still remember how beautiful and sweet our wedding was. And wow - I think we are still happy together after all these years. I was looking at this site for philadelphia wedding photography by Scott Lewis and thought it was really different. I like the way he captures very real moments of his subjects. I am just buzzing along and seeing where the story takes me. I like the prose style ... it has a sort of theatrical flair as we read what the characters are thinking and how they think about their world in particular. Since we have different personalities and world views in the many different characters it gives the author to have a chance to do some philosophising here and there. Let's face it, the SciFiJungle.com T-shirt shop is not a big business for me. I did see one last month though. My kids wear theirs and look cute as pie with the dragons. I like the idea of being able to do custom t-shirts. The technology we have these days at our disposal is really awesome. You can set up custom books, custom shirts, even make your own custom fabric from your own design. Technology has given us so many cool tools. And then you can go low tech too - tie dye, reverse designs with bleach pen, for example. Not to mention all the cool things people are doing with cutting and resewing t shirts. T-shirt quilts are really popular too - you can send off your t-shirt collection and have someone make it into a quilt! Isn't this just the most beautiful thing you've ever seen? Those that read and enjoyed "The Dragon's Path" take heart, the sequel is here on Tuesday. I enjoyed the Dragon's Path. It is a deep and political tale, with lots of characters, twists, turns, history and portents of doom. Just the kind of thing to keep an epic fantasy reader busy for awhile. Every Single One of the Ferengi Rules of Acquisition. In Order. In honor of my two favorite capitalists, here is a YouTube Video of every single one of the Ferengi "Rules of Acquisition" from Star Trek Deep Space Nine. In Order. By the way my two favorite capitalists are my Mom and Warren Buffet. The best one might be the last - the 285th Rule of Acquisition - No Good Deed Goes Unpunished. Next time you are web conferencing a business meeting, I suggest you play this. Some of these are just plain classics. After a log and arduous wait for Tricked to come out, it turned out that I was busy reading someting else when I got it on my Kindle. I finished the first in the Kara Gillian series by Diana Rowland and was into the second book "Blood of the Demon" when I got "Tricked." Now as you may know, I got sucked into the Iron Druid series and shared it with a bunch of people I know including both my Mom and Pops! I've been really looking forward to see more Atticus and Oberon, and I had a hunch that Tricked was going to feature Coyote, and I really like the way Kevin Hearne interprets the Navaho god Coyote. My favorite part? Where Atticus needs to buy a buttload (as opposed to a fuckton) of nails to make caltrips. I wonder if you can buy a buttload at milwaukee tool? All in all a great book. I like the way that Atticus realizes that his actions in book three were STUPID. (I had a little issue with this - how can he have survived for so long and yet be so stupid!) But that's part of what makes the character so cool - he is like a 1000 year old young kid with massive powers. But he's just a kid in a lot of ways even as he has a great deal of wisdom it is a naive wisdom. I guess he's sort of a surfer dude Druid, and that makes the books so much fun.